Pinch Cake Recipe Tasty and soft texture can also be made simply without a mixer. 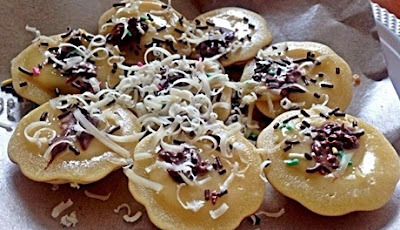 The wet cake is one of a variety of snacks traditional markets as a simple snack that is popular in some areas as it is often traded brother-brother in Jakarta and Bandung. This time the recipe is an easy way that is simple enough to produce a pinch cake with delicious taste, soft and fluffy. Currently pinch cakes are becoming increasingly popular because it has been modified in such a way with a touch of creative hands so that both taste and appearance shape and the colors are not less interesting with pastries other modern wet. Many variations that can develop in a way to make delicious cakes and soft pinch by using the following basic dough. We can use the molds in a variety of forms, the creation of a variety of toppings and in addition we can also combine the batter with a variety of flavors to taste. One way is to simply add powdered green tea or chocolate in the dough to make a cake recipe pinch flavor of green tea or chocolate cake pinch maybe even a variety of other flavors. Other tasty creations pinch cake in Cake Recipe Pinch Green Tea and Red Velvet. Prepare a container and then fill in the eggs and sugar, beat until fluffy and sugar become soluble. The picture above is the result of a pinching cake whipped without a mixer, but can also use a mixer to more easily and quickly expands. Enter the flour gradually and mix well. Pour liquid margarine, stir well and then enter the baking soda, baking powder and vanilla powder. After the dough flat, put the mixture into a container that is his mouth like a teapot or measuring cups so that the dough more easily when poured into the mold. Heat the cake mold pinch over a small fire that first spread with a little margarine. Once hot, pour the batter with half the volume of the mold then closes. When the dough is partially cooked and fluffy, sprinkle with cheese or chocolate meses then cover and continue to bake until cooked and the bottom of the cake is slightly brown. Remove from molds and serve and if it has the rest of the grated cheese and sprinkle on top of the cake so that the pinch is more yummy. In addition to the above recipe, we can also vary the recipe to make a cake with a simple pinch jackfruit flavor combinations, while I make jackfruit are also in an easy way. Beat eggs, sugar and margarine using a whisk eggs until fluffy, enter the sweetened condensed milk and baking powder. Whisk until blended and then enter the water and beat again, last put the flour proteins were. Stir with a spatula until blended and no new clot then enter jackfruit pieces and stir well. Heat the molds, pour the batter until it is full or the average of the mold then cover and cook until half cooked. Sprinkle with chocolate meses and cover again and cook until evenly Metang. Pick up and ready to be served.